held by two stands on either end. A long process of about 6 hour depending on the weight of the lamb. You start by searing it at the bottom over lots of hot charcoal close to the lamb for about half an hour with continuous slow rotation then raising it higher up to let it cook slowly. Occasionally Greeks make the Kokoretsi. The spleen, heart, liver, and lungs of the lamb are cut up in medium size pieces, well seasoned with salt, pepper and oregano, passed through another thinner skewer. All the ofal are then held together by the extremely well washed (in and out) intestine. 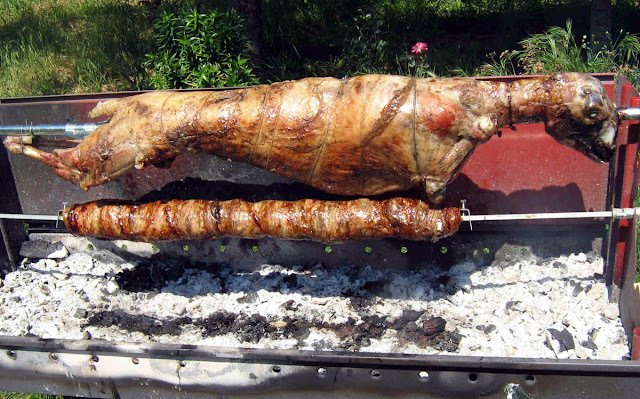 This Kokoretsi joins the lamb during the cooking with another rotating motor. It is placed under the lamb so as to be basted by the lambs juices as it cooks. Photo above is courtesy of Google. It is not my picture. Of course during all this process there is a lot of wine and ouzo drinking with various Greek dancing. I would like to show you quickly some pictures with some explanations basing myself on the fact that everybody knows how to cook, grill and BBQ the various dishes I made for yesterday's 2014 Easter lunch. We did not cook a whole lamb on the spit because we live in an apartment in the middle of the city. We just took various parts of lamb and pork marinated each in a different way and cooked them all on the grill. - One Leg of lamb (New Zealand) kept and bbqed whole with garlic pieces, salt, pepper, and rosemary stuck into deep cuts made with a sharp knife and an overall basting of olive oil and rosemary ran through the mixer. - One Rack of lamb (New Zealand) kept whole and French trimmed as per picture basted with olive oil, and seasoned with only salt and pepper. - Two Racks of lamb (Greek) cut in cutlets Greek way seasoned with salt, pepper and lots of lemon juice. - Cherry tomatoes, fresh white mushrooms, green, red, yellow peppers, and mango, cut into small pieces and passed through individual skewers and basted with oil, seasoned with salt and pepper. - Baby potatoes also passed through a skewer, well basted with olive oil, and sprinkled with salt, pepper and fresh sage, wrapped into oven proof paper with aluminum foil as a final wrap. French trimmed by me rack of Lamb. Beautifully cooked French trimmed rack of lamb. oven paper lined aluminum foil. Whole view of the skewer holding the baby potatoes. You can see the wooden skewer holding them up. I hope I gave you some ideas what to put on your grill in order to spend a nice Easter next year Inchallah! !